This is a great app to use for stat keeping. I’ve been using this app for 5seasons now and the ability to get instant real time data to help during radio broadcast has been extremely beneficial. If I could add 1 ask for the developer, is there a way to add a function during a live game scorekeeping that would allow you to create and add a new player to the roster without having to exit the game. I think this is one of the best stat apps available. I would have given it 5 stars but they need to make one change. And that's the font, it is a little distracting and hard to make out especially on a phone. I hope they change it and use a clear and crisp font. Like the app's functionality and report capabilities. Really dislike the graphics/fonts. Would like to see a feature that would make it easy to stat practice scrimmages with my team split into two teams. Like any other program, you will need a couple spotters to make sure you are accurate in a fast paced game and don't get flustered! Very easy to use and the info is incredible. The email and facebook feature are fantastic as well. Great, Great ap for high school and small college basketball programs! 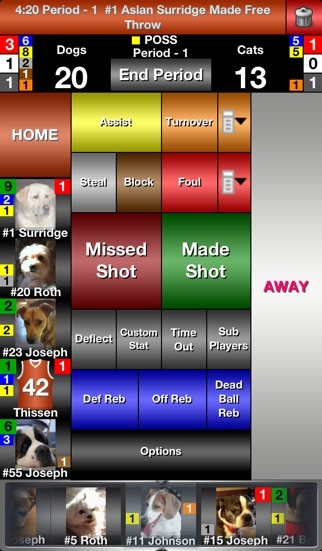 Great tool for scoring a game, and keeping stats for each game and for a whole season. I printout weekly reports for each player, so they can keep track of each game, and their progression for a season. Best of the apps and reasonably priced. This is very easy to use. I used it last year and the changes this year made it easier to use. I highly recommend it to anyone. The support staff is great and very prompt to address any problem or issue. This app has been great for me and my family. The support is spot on well worth the cost. This is one the best apps I've used to keep stats with. The design is nearly perfect and it makes keeping stats a breeze. I would recommend this to anyone looking to keep stats using a apple device. Helps to give more insight to the team's and overall performance. 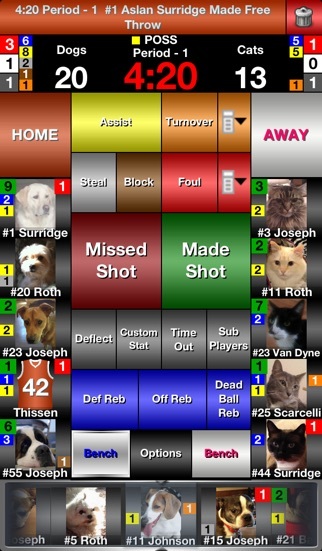 I really like using the Itouch Stats basketball software, easy to use even in the fast pace of the game. Customer service is also great. The turnaround time of getting any questions answered is awesome. I recommend this for any middle school or high school basketball programs. Easy enough for student managers to keep track of. Have used for years but this year my MaxPreps export isn't working. This a great stats app! I have found it easy to use and this app covers every stat you would ever want to record. I have found it very useful tracking stats for my son's basketball team and his coach appreciates the detailed reports from iTouchStats. Well worth the cost. What an incredible app. Thank you. Takes some time to learn but there can't possibly be a quicker or more efficient way out there to track stats. Suggest a 6th "bucket" player for those "who dun it" stats that a stat keeper can't figure out on the fly. I have used countless stat apps and have yet to find one that I like till now!! This app is easy to use and if you have any questions Travis will get back to you so quick. You should give this a try and it also loads straight to maxpreps which makes it even more awesome. This app is so easy to use. Once you become familiar w the buttons it couldn't be simpler. I like that I can turn off the clock, shot making and auto functions. My coach likes the report. If someone misses a game the log tells them exactly what happens. I highly recommend this. Mainly because it can be as simple or detailed as you want. My friends actually have fun telling me plays if I miss one. And my son loves the report when he gets home. Worth every penny. I foresee using this the next 4 years. Glad to see the improvements which will help immensely. Getting subs logged in was always tough if multiple subs entered at one time. Customer support is A+++++++. I've gotten immediate emails and even texts when I made mistakes during a game to help me out! After checking out several alternatives, I'm so glad I went with this program over any other. People are always blown away when they see me at work with this. I've sold several opposing coaches on this program. Saves so much time compiling up to date stats for the year also. I have used this product for about 3 years and have been very pleased with it. The only beef I have had was hat it was hard to keep up with the subs during a live game. The new update is very very very frustrating. I was excited to see the new sub layout and believe that it will work but about 25% of the time you have your sub-in and sub-out selected and it doesn't recognize it so you have to cancel and re-do, all the while missing what's happening in the game. I went to do my 3rd live game last night and couldn't create a new game as the wave button was unavailable. After dinking with it for half the game it magically appeared but then I once is selected the starters I was told 0 of 5 had been selected when in fact all 5 slots were selected so I finally conceded and turned the program off. There are currently a lot of bugs and a steep learning curve (if you are used to the old system), but I believe once the bugs are worked out and after about 5-10 games it will be a better program. Easy to use.. I use it to take stats for my son's AAU Team.. Wish subbing was a little easier but its still a great app.. This program is the easiest program to use on the market. My 8th grade daughter was able to stat a varsity game after practicing for only 10 minutes. The reports are as detailed as they come. The most expensive programs are average compared to this. Great job, keep up the great work!!!! The customer service is by far the best around. I have emailed the company several times with suggestions and questions, and they have answered within minutes. Every update has separated this program further and further from all others. You don't need any other program to do basketball stats. This is by far the best investment I've made in my coaching career (23 years). I can't wait to play games just to do stats. Don't tell anybody, but I've had my xbox play 2k11 by itself so I can take stats (that's too addictive isn't it). Travis, keep up the good work and this will be THE standard program for serious statisticians. Hands down the best basketball stat program on the iPad. Such a great app!! The controls are so easy to use and access. Also it is very simple to teach someone else...just love it! Totally worth your money!! Wow, is this for real?! By far the BEST app I've ever purchased. This thing has everything you can imagine for keeping stats for basketball. Truely a great investment for running my league. Well done, bravo! Like this! Wish I could make corrections. We really like the program and find it useful in real time It would be nice to be able to go back and make corrections at the time or especially later when watching film. Coach can use the stats at half time even knowing they may not be perfect. They certainly give him a good idea of how team is doing. He can specify what is most important to him. For example, points, fouls, turnovers, shot chart, etc. because in a fast moving game you may have to let a few things go. In talking to folks from other high schools and Rex leagues, who have tried apps, I am convinced this is the best one! Hope they will adjust it a little to be able to make corrections easy. This is my second year using this app for my boys high school basketball team. The app takes some patience to set up. 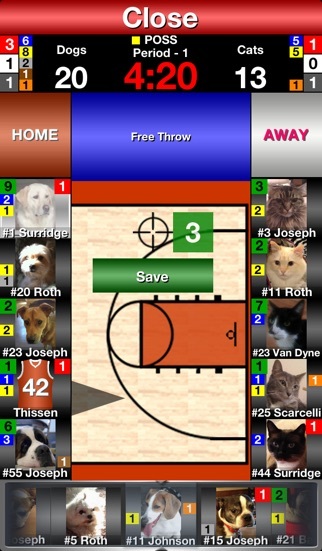 There is a learning curve that is required to learn how to use the app during a normal game. Over time it is seamless and easy. This is by far the best app. You can look at your player or your team and pin point the trending stat that you are looking for. 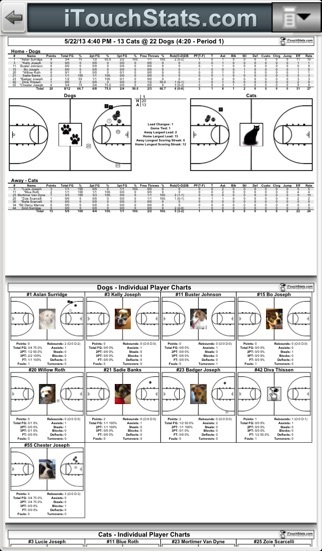 The box score sheets are great and work well to export to fellow coaches or parents. The maxprep export feature is a wonderful tool as well. If there were a way to rate something more than 5 stars, I certainly would! Perfect app Works like I charm. I would just like to say your response time and customer service is top notch. I love the app! I am doing my best to spread the word on how easy yet perfect this app is. Well worth $10! Incredibly easy to use on iPad & iPhone. Easily customizable with ultra-detail or just basic scoreboard. Really satisfied with purchase. I needed a product to help me manage the stats of my games beyond scores and fouls; and this is it! This app will help me grow my league tremendously. They charged for me for no reason!! I downloaded the app last minute because I was having trouble with the app on my iPad. But minutes later, the app started working on my iPad so I didn't even touch the app on my phone. Days later, I see a charge for $10 on my account?! When I know for a fact I didn't charge or buy anything from the app! This is ridiculous and they need to refund my darn account! The new version makes an already good ap even better. This ap is easily worth the cost. Its so mich more user friendly than any other stat keeping ap I have found. I use this to keep stats for a high school team. Subbing needs to be a little easier but other than that it works great. 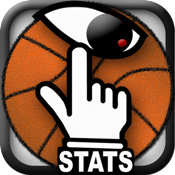 This is the best app available for basketball stats. It is perfectly designed so you can take stats easily and quickly. 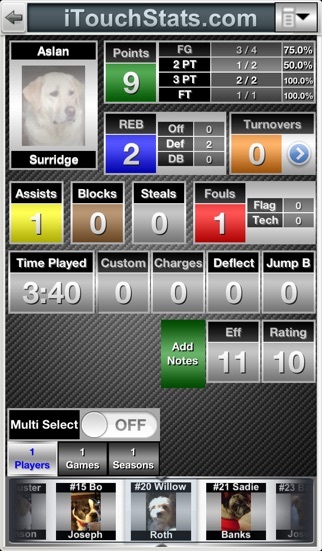 It has every stat and report you need to manage and coach your team. I have tried every stat app out there and this is the best. So get it today. Easy to use, awesome stat reports! Well worth it! I love the way you can create a ratings system. Easy to use. However, they need to fix the app to where it won't crash in the middle of a game. Very clumsy, difficult to navigate. Long learning curve. With a little practice, app is easy to use and comprehensive. The only negative is there are too many steps to substitute players. Wish you could just tap on the two players instead of having to pick player, select "sub", pick sub from pop up list (sometimes twice), then select done. By far the best app for basketball and great customer support. The recent upgrade is exactly what we needed. We will continue to use the app for the Winter bball season. Also, the support is great. Thanks Travis and keep up the good work. The Best App for Stats! I love this app. I have been using it for years. It is a great coaching tool. Helps players work on their weaknesses and learn from mistakes. Highly recommend! This App is easy to use, simple to master and thoughtfully designed. The reports it generates are second-to-none and it's stat keeping ability is very comprehensive. I had tried a couple other apps prior to finding this one and it is by far the BEST. Our adult league team, the Blacktop Vets, have used it in our city basketball league for over 10 seasons and it never ceases to be amazing. Buy it and you won't be disappointed!! I like the new updates. Easy to use. The best stat taking app on the market.